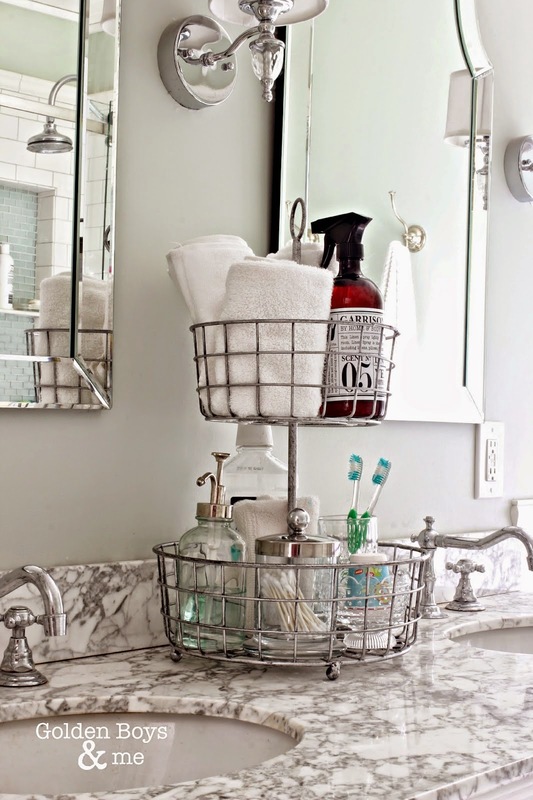 Do you have a tiny bathroom in your apartment or home? If you are nodding your head and sighing, I feel your pain. There is nothing worse than trying to figure out where to put towels in a small bathroom. Okay, so I exaggerate. It is not the worst thing. But trying to organize a small bathroom is frustrating. But don't give up. I have some clever storage ideas that fall into the cheap category. Cheap, however, does not have to mean ugly. 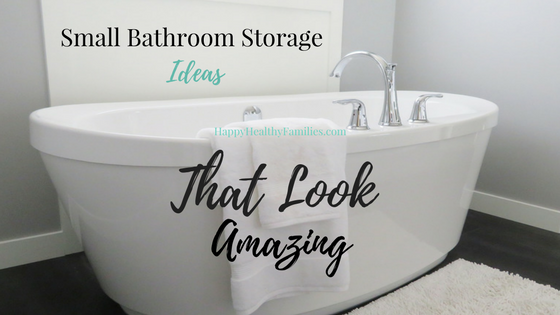 In fact, when you take a look at these creative bathroom storage ideas I found on Pinterest, I think you'll agree with me that they look downright expensive! Ready?? DIY Storage Shelves With Inverted Brackets. 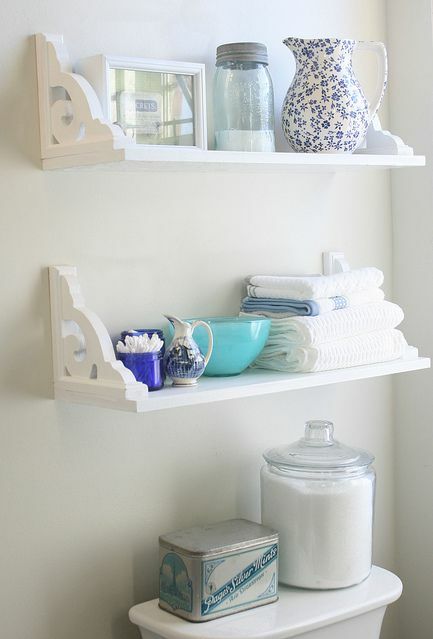 Seriously, if you have open real estate above the toilet (or any wall in your bathroom) these shelves are perfect. I have seen many DIY shelving ideas before, lots, but never found any that I loved before. These I Love. The inverted brackets add such a cute cottage style feel and will help keep all that stuff you put on the shelf to stay on the shelf! 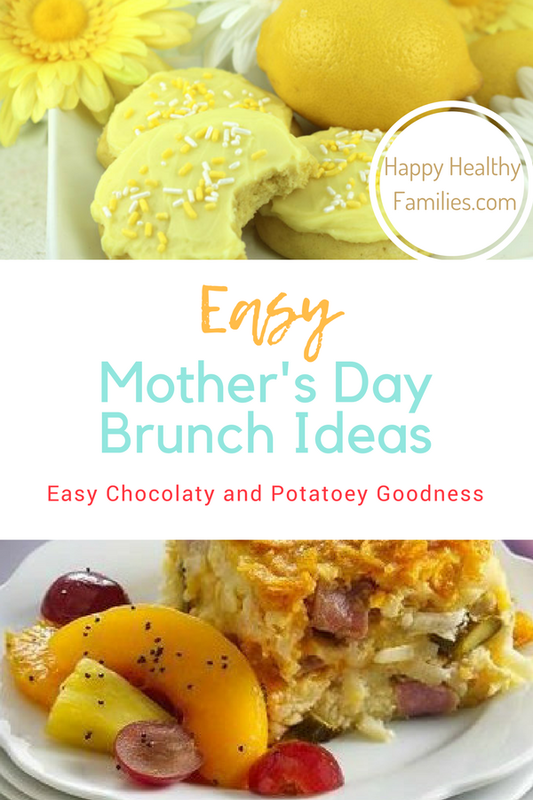 Get the tutorial at First Home Dreams. 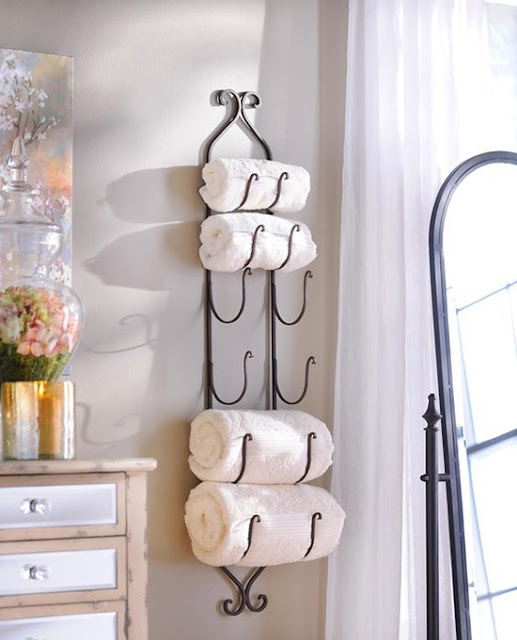 Back of Door Towel Rack. There are lots of cool over-the-door towel racks that will instantly give you extra places to hang towels and robes, like this bronze rack with hooks from Amazon. I especially love this creative storage solution. 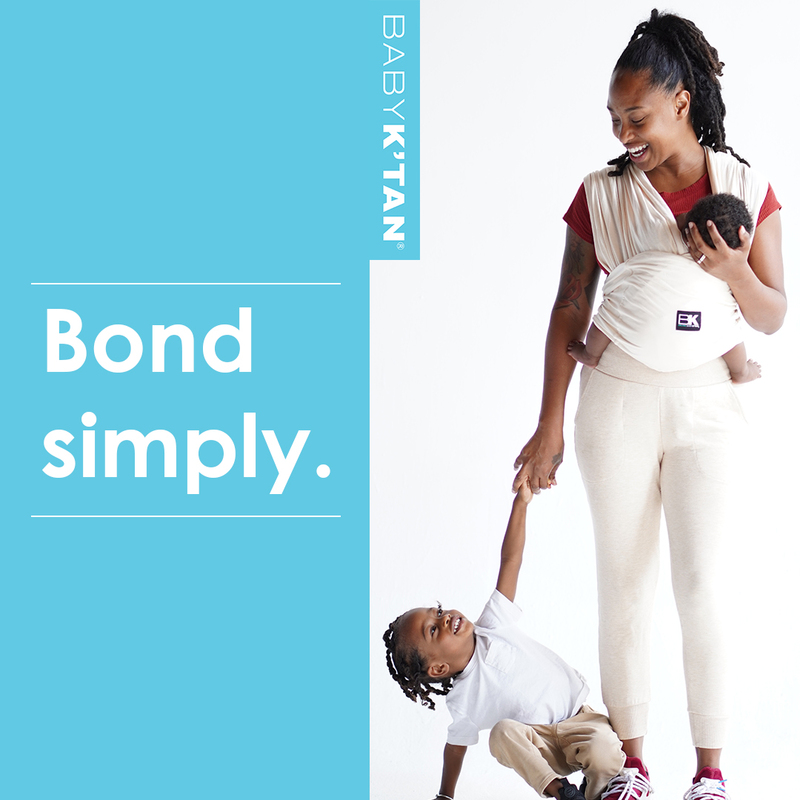 It is simple and inexpensive but elegant looking! If you do not have a wine rack available to use, here are a couple you can check out. If you have been wanting to add some shelves in your small apartment bathroom, but are worried about built-ins, look no further! 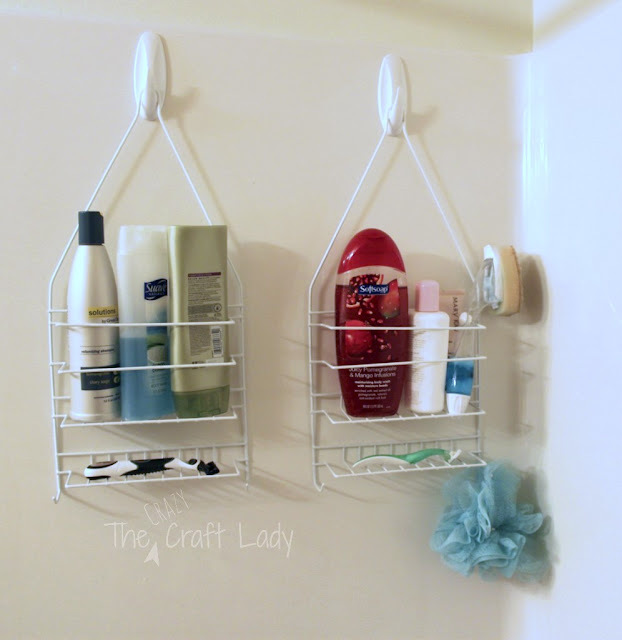 Shanty2Chic can show you how to make this amazing hanging bathroom shelf for $10. Just hang on your wall, then take it with you when you move! 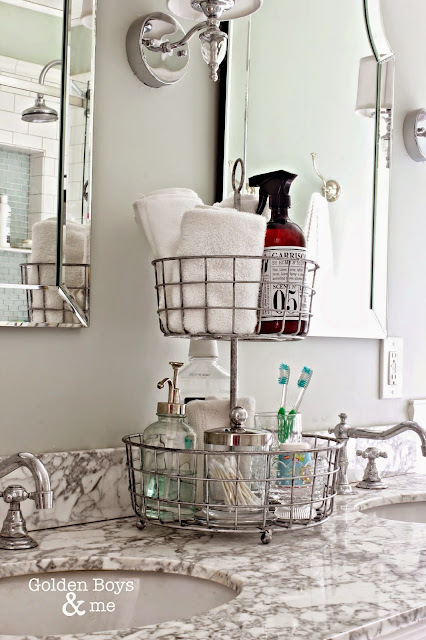 Visit your Dollar store and pick up a couple of fresh new hanging shower caddies, just like Aimee aka The Crazy Craft Lady does. You can use 2 3M Hooks to hang the caddies in your shower so they both fit. MiniOwls Bath Combo - Set of 4 Toothbrush Holders & 2 Hooks with Yellow Duck Suction Cups.